In the wake of food safety scares at big-box sellers like Chipotle and Trader Joe’s, NC State University food scientists are harnessing the power of virtual reality to keep contaminants off your dinner plate. 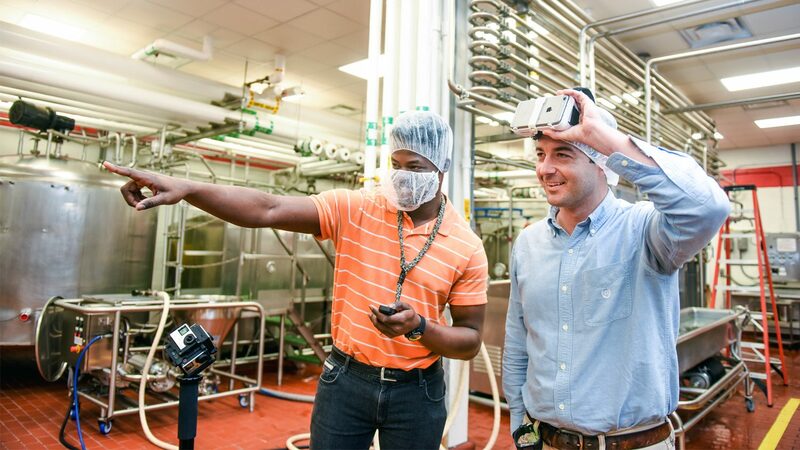 NC State food science researcher Clint Stevenson and his team have developed full-immersion virtual reality training sessions that allow students and professionals to interact with virtual representations of real-world food manufacturing facilities, scouting for safety violations. Pop on a virtual reality headset (any commercially available brand will do), and you’ll find yourself standing in the middle of a bustling seafood restaurant, or the factory that makes Howling Cow ice cream. Look up, look down, turn around — the environment developed by Stevenson and his team is a 360-degree experience. The virtual reality recordings were all made on-site at active businesses; food safety risks like microbial contamination or pests can be digitally staged. “Hot spots,” or interactive buttons within each session, allow participants to look closer, gather more information or answer quiz questions. The training tools are also compatible with standard tablet, mobile or desktop screens. This makes them widely accessible for both educational and industry use. “Not many companies are exploring virtual reality for their training programs, so we’re building a code of practice that they could adopt,” Stevenson said. The team, whose work was partially funded by the NC State Office of Outreach and Engagement, includes virtual reality specialist Elias Clarke Campbell and instructional designers Bethanne Tobey and Julie Yamamoto. Their work was used in an online course on Good Manufacturing Practices as part of a contract for the North Carolina Department of Agriculture and Consumer Services, which has also given Stevenson permission to repurpose the course for both college and continuing education students. This means that college students and industry professionals will receive the same training as food safety inspectors within the government. Since those are the positions many students seek after graduation, Stevenson’s work gives them an edge in the job market. Stevenson foresees a workforce shortage of food safety professionals as baby boomers retire. He is researching the extent to which virtual reality can enhance expertise in food safety — behavior, skills, knowledge or all of the above. “This all looks really cool, but we’re not doing it to play with gadgets — what matters is keeping unsafe food out of your fridge,” Stevenson said.